Shows time of event, but misses on time to event. Hard to grasp urgency. Boring event display. Hard to distinguish events from each other. 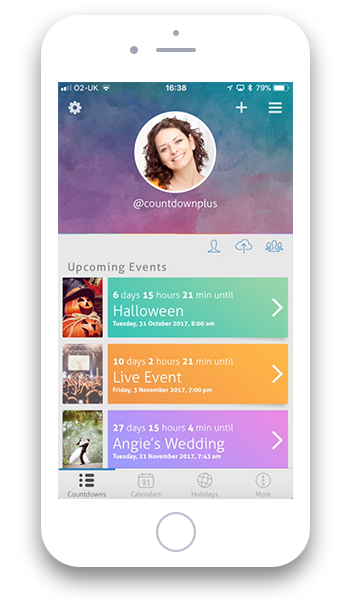 Counting down to your wedding for example, continues to count up after the wedding date so you see how long you've been married for. You also continue getting reminders for your anniversary there after. 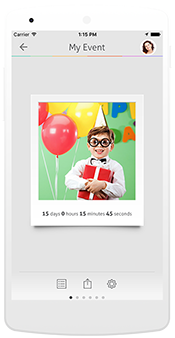 Countdown+ caters to every special event type in your life, and treats them just as special and uniquely as you do! Planning a trip with loved ones. Do it together! Countdown to the olympics, world cup or when your favorite team is playing next! Countdown to the big day, and get reminded of your anniversary every year afterwards. Don't miss the premier of your favorite movies and TV shows. Countdown with family and friends! 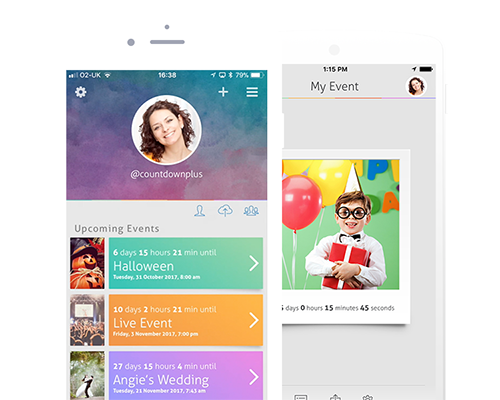 Fully customize your countdown event. Countdown to an event in the past or count up to an event in the future.